They, along with several other creative thinkers, came through with ideas like they’d been deep breathing oxygen in a high school chemistry class. Their open-minded discussions prove how good design—which we all know is the visual communication of a message—results from collaboration between the designer, the client and widespread research (which, in this case, was provided by my awesome Facebook friends). 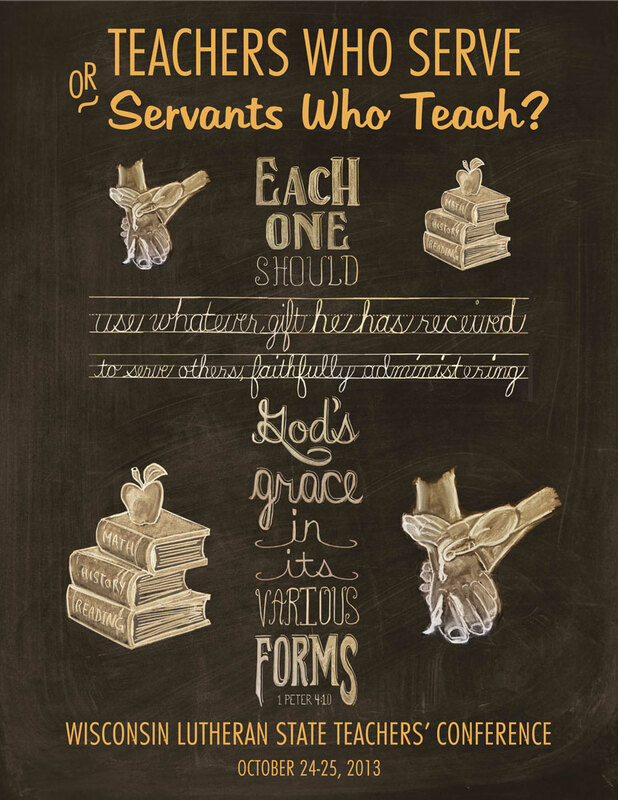 This year’s theme is “Ministering as Servants of Christ: Teachers Who Serve or Servants Who Teach?” My graphic designer friend, Rhonda Hoffmann, immediately pointed out the duality of the theme. She compared it to the negative and positive space artists often use, particularly M.C. Escher. This yin and yang, if you will, became my thought process throughout the project. Teachers are leaders. They are respected authorities and great counsels of knowledge for both students and parents. Yet much of what teachers do is in loving servitude for their students. We see them kneeling to tie a shoe. Or working with their hands to help a child learn. It reminds us of Jesus washing the feet of his disciples, as several friends suggested. I then wanted to challenge conference attendees to think a little deeper. Voilà, the chalkboard! Chalkboard art is huge these days. Google it and you come up with beautiful work all over the web. So when conceptualizing yin and yang for teachers, I immediately thought of the black and white of chalkboards. Remember those things—those dusty, nail-screeching slates of so long ago? So here it is…The 2013 WLSTC registration program. 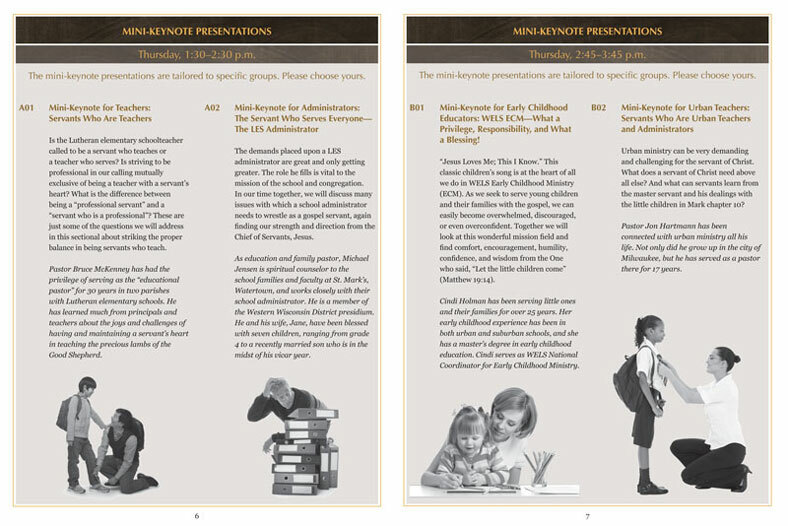 Click here and check out the conference, or click here and see the program in full. It’s a great collaborative effort, thanks to conference coordinator Kris Synder and my creative friends! Want to work together for your next conference program? Call Adunate at 920-261-5519 or send me an email.